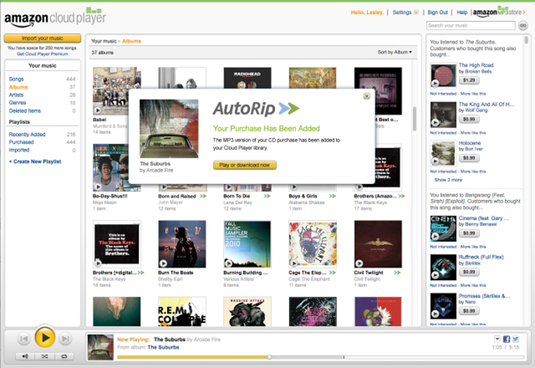 Amazon have announced a new service which will offer downloads to shoppers who purchased CDs and vinyl from the site. The new service, called AutoRip, will give shoppers a digital version of the music they buy on other formats, several days before it arrives in the post. It will also be backdated for any past purchases going back to 1999. The online retailer, who hope the new move will help them close the gap on iTunes, still way out in front as the leading download service, have already lined up more than 350,000 titles for AutoRip, with more to be added, and said there will be no knock-on effect on prices. The tracks will be added to users' Amazon Cloud Player accounts and can be either streamed or downloaded to devices such as iPhones, iPads, Kindles and smartphones. The Amazon site will show whether AutoRip versions are available when consumers check out information about potential purchases, although it will not work if items were bought as gifts for other people. And it does not apply to items bought from private sellers in the Amazon Marketplace – only those bought directly from Amazon. Latest figures for the UK market show Amazon became the leading music retailer in 2012, accounting for 25.6 per cent of expenditure (15.3 per cent for home delivery and 10.3 per cent downloads) and taking over from HMV, which had been in front the previous year. iTunes, however, still accounts for 22.5 per cent of the entire music market, up from 17.9 per cent the previous year, according to data from Kantar Worldpanel used by the British Phonographic Industry. Jeff Bezos, the CEO and founder of Amazon.com, said: "What would you say if you bought CDs, vinyl or even cassettes from a company 14 years ago and then 14 years later that company licensed the rights from the record companies to give you the MP3 versions of those albums and then, to top it off, did that for you automatically? "Well starting today, it's available to all of our Amazon.co.uk customers - past, present and future at no cost. We love these opportunities to do something extra for our customers."